For this week’s One Room Challenge update of my home office, we finally have new flooring! It took a while to come in, but I’m happy it’s here and finally installed. 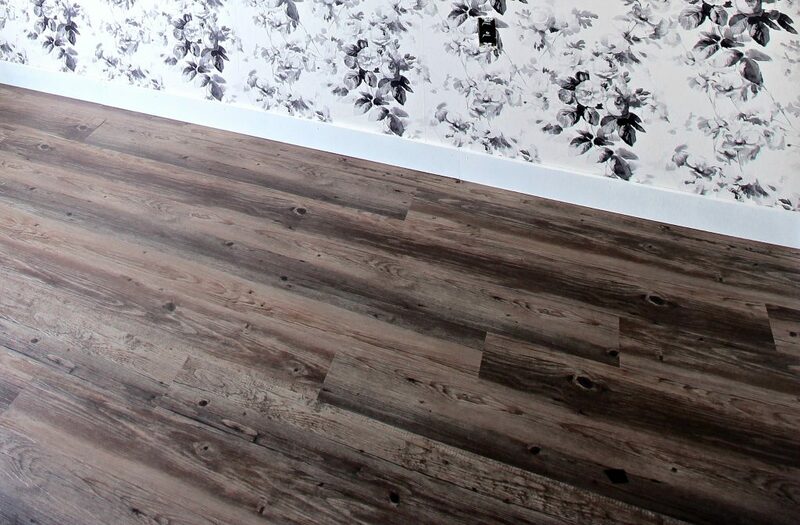 We went with the same luxury vinyl tile plank flooring that we have throughout our home. You can see my post about it HERE. I love the dark shade of the planks and the fact that they have texture, which makes it look more like real hardwood. To save some money, we made our own baseboard trim using the MDF that I had cut in the wrong size for the closet shelves. Mark used his Ryobi table saw to cut down the sheets lengthwise into 4 inch pieces. Then, they were primed and painted. It was a way to use up what material we had and, of course, save some money! 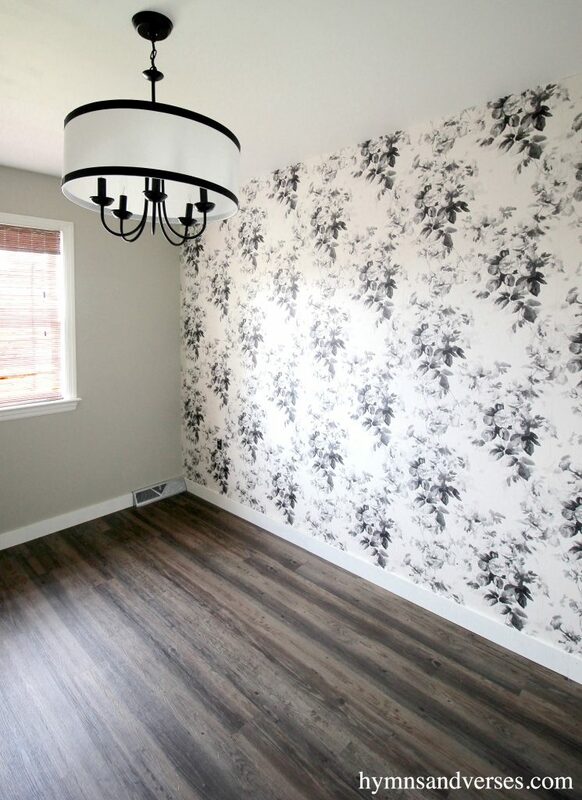 I wanted a classic light fixture in the room that was black or white. 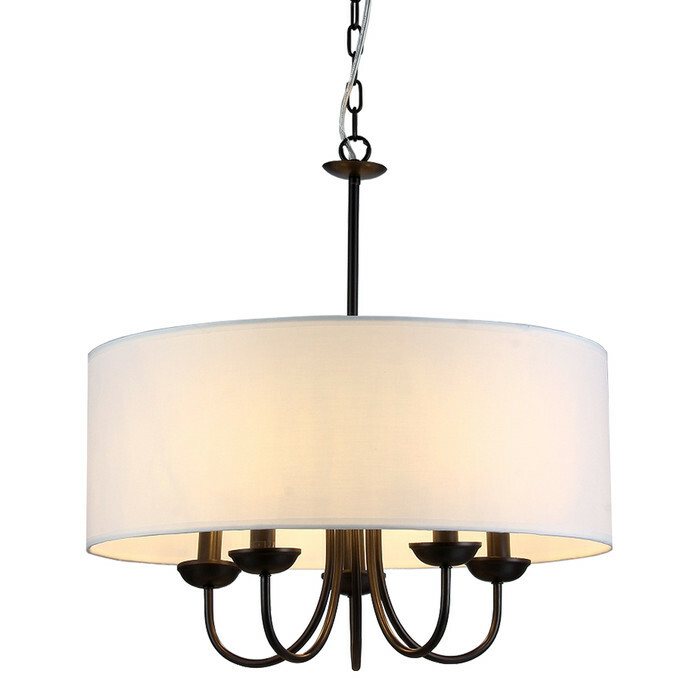 I initially thought I wanted a large drum pendant in black, but then I saw this chandelier on Wayfair and thought it would be perfect! When it arrived I thought the white shade looked kind of blah. So, I simply glued some black grosgrain ribbon around the top and bottom of the shade. That little touch makes such a difference! If you missed last week’s post about how I added some buffalo check fabric to the interior walls of my closet, you can see that post HERE. We are in the final stretch of this makeover! Next week will be the final reveal! I’m so excited! We’ll be moving the furniture into the room, adding some decor, and hopefully I’ll have my work table finished in time to share it! It’s where I’ll be making and creating and an important element of this space! 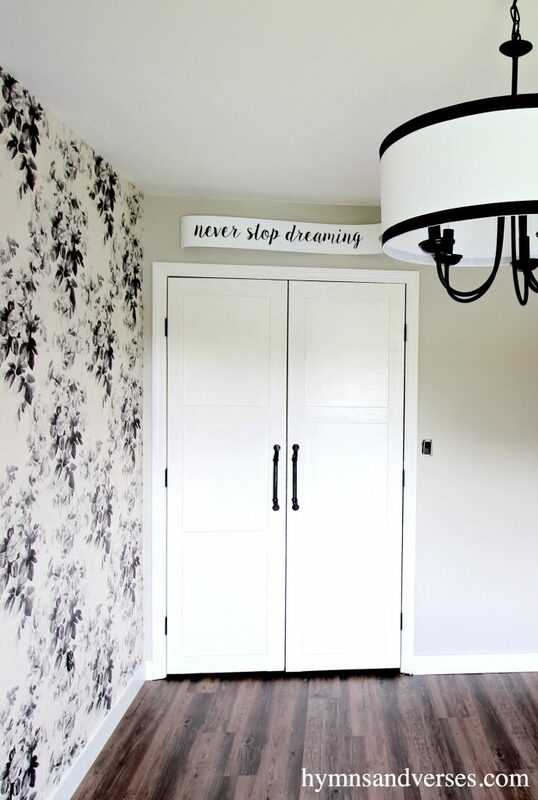 Thanks for following along with my One Room Challenge home office design! Don’t forget to check out all of the other guest participants of the One Room Challenge to see their Week 6 updates! Below are the links to my other One Room Challenge posts! This looks so good and beautiful. I can’t wait until the final reveal. I LOVE it! I also have a lot of black and white in my home…chandelier is Gorgeous!! So looking forward to the final reveal! Loving the black and white. It is so classic, yet still on point. Just beautiful! Oh, so pretty. I love that wallpaper is coming back. I could stay in your room all day. 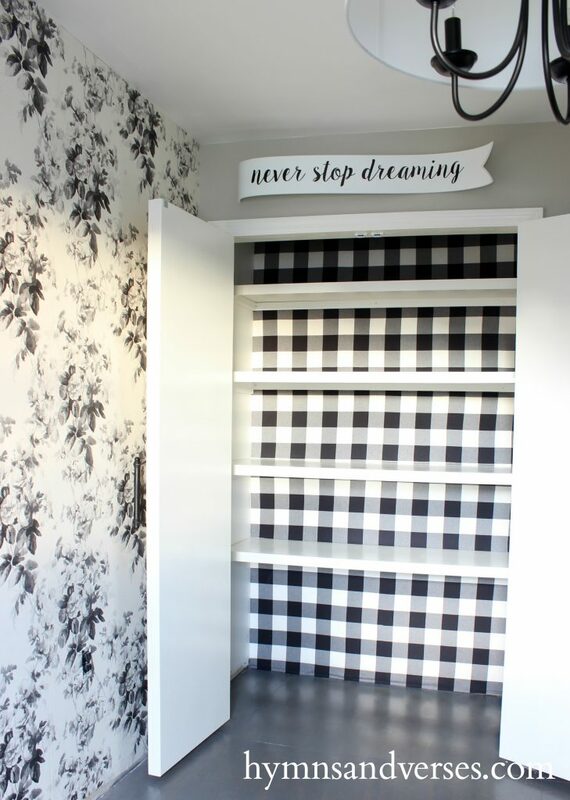 oh loving the black and white, especially with the unexpected plaid in the closet! FUN!!! Can’t wait to see it all in Week 7! Doreen, this is going to be amazing! I think this is giving me #patternenvy! Can’t wait to see your reveal. This is sooo beautiful! It makes such a statement. The shad pops with the grosgrain ribbon. The flooring ties all the room together. Such fun when this room becomes your wrapping station for your Christmas gifts? !